I know op shopping is not a competition, but don’t you sometimes wish it were? I’m always interested in seeing what fabulous bargains other people have found and as you may be aware, I very, very occasionally go op shopping myself and sometimes I even post about it. (In case you couldn’t tell, I’m talking in opposites). Anyway I just wanted to say if op shopping WERE an Olympic sport (and there is something of a grassroots movement supporting it… check the comments from this post) then I think Australia (represented by me.. do I have to spell this out!?) 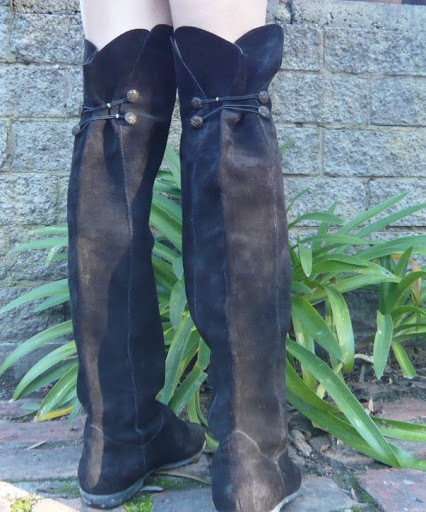 would have got GOLD GOLD GOLD last Friday… check out these boots that I found for $16.99 at the Salvos in Dandenong (this post led me there on the day I bought these, although I have visited many times of my own accord)!!! Like any esteemed athlete (op-lete? ), I’d like to give you an insight into my victory… LOOK UP!! Yes, that’s the insight. The only reason I found these black booties is because I lifted my gaze heavenward, and lo, there they were, resting on the shelf above me as if the god of cool thigh-high boots had answered the prayers that I didn’t even know I was saying. Prayers for very long boots in black suede with flat soles that don’t make you look like you should be standing on a street corner late at night (in a bizarre twist, Pretty Woman was on TV this week). Meanwhile, I’m sure all my friends are very happy that I found these lovelies, especially the friends who chipped in to buy me a voucher for my birthday for long black boots from a proper shoe shop that sells NEW shoes. I wore them to dinner the other night and some of them just rolled their eyes despairingly at me when I told them I’d found these second-hand ones. You can take the girl out of the op shop but you can’t take the op shop out of the girl. Most awesome boots my dear, your the queen of cool finds! Nothing beats the thrill of the find don't you think? Paying squillions of dollars on lovelies just leaves you feeling guilty bit not so the op shop treasures. So fill me in what is Literary Speed dating sounds interesting? Oh, just posted illustration and info about the Cowheard and Weaver it has been interesting to research. Great find! One of my favourite pairs of boots are a taupe-grey pair from the thrift store, they were a fabulous $6 and I get compliments on them all the time! Oh I love Erin Brockovich, and yes, I noticed the MASSIVE mobile phones in Pretty Woman, there's a scene where a father and son are driving in a sportscar and both are talking on mobiles thinking they look so cool, but viewed through today's eyes they just look ridiculous and you know they're going to get RSI from lifting such bricks to their ears.Literary speed dating.. I put a link within my post about it, but here's a bit more: http://www.facebook.com/home.php?#!/notes/the-wheeler-centre-for-books-writing-and-ideas/literary-speed-reader/446754068131and http://wheelercentre.com/dailies/yesterday#post-8c0e3555754eBasically everyone brings their favourite book (mine was World Textiles) and you get 5 mins to talk before you move on to the next person, the book is a very handy crutch as 5 mins can be excruciating if you're not clicking!